Doc’s note: Cannabis investments are hot right now. 2018 was a groundbreaking year for the industry and now, everyone wants to know how to benefit. That’s why today, I’m sharing an essay from our newest senior analyst – Thomas Carroll. If anyone understands the nuances of the pot industry, it’s Thomas. Today, he explains what’s going on with cannabis today and how to avoid risky pot stocks. If you want to learn even more about the opportunity in cannabis, we’re hosting the first-ever Cannabis Investing Event on March 27 at 8 p.m. Eastern time. Tom plans to detail the incredible shakeup in the world of cannabis investing… And how you can keep from missing your chance to invest in cannabis before the biggest gains are gone. It’s time to rethink everything you believe about cannabis. If you’ve been attentive at all to the news for the past few years, you have undoubtedly heard something about the biggest thing to impact medicine, health and wellness, and happy hour. The cannabis plant is rapidly become deregulated, decriminalized, and much better understood by people across all walks of life. Entrepreneurs are taking their companies from startup to the real deal. From our Canadian neighbors to the north, to Mexico to our south, to Europe and Asia, governments are rapidly recognizing the benefits of cannabis for medicinal and other purposes. This will impact how many people live their lives. It is also a huge new product market where we can invest. Imagine having new options to try for managing that nagging back pain. Or being able to get more than four hours of sleep a night. Or taking the edge off after a stressful week. All can be done without getting drunk or high. But only if you want to. The decriminalization and legalization of cannabis often draws comparison to the end of Prohibition of alcohol. But it’s much, much bigger. The Prohibition analogy sells the cannabis revolution short. Cannabis lets users relax and unwind in different ways – ways that don’t leave you with a hangover or groggy the next day. So the markets that it will take share from are much bigger than simply alcohol, which measures more than $100 billion annually. For example, maybe you smoke a cigar, or pipe, or use cigarettes to take a break. Tobacco itself is another $100 billion annually. How about health and wellness? In the U.S., it is estimated that we will spend $88 billion for “nutraceuticals” by 2021. This is the collective name for vitamins, lotions, creams, powder, and other products that are not specifically medicine. And speaking of medicine, folks in the U.S. spent an estimated $360 billion in 2018 at retail pharmacies… filling the pockets of drug companies and pharmacy benefit managers. Cannabis will take a part of this as well. Humans have been using this plant no matter its legal status for more than 1,000 years. Our initial skepticism of so called “pot stocks” is lessening. We are not late to the party. It is only getting started. There were five major milestones that occurred in 2018 that won’t be undone. 1. First, Canada legalized cannabis for adult use nationwide. 2. Then the Farm Bill in the U.S. was signed into law. This legalized the hemp industry, a cousin of the cannabis plant, nationwide. 3. Third, the U.S. Food and Drug Administration (FDA) approved Epidiolex for use in people with two forms of rare epilepsy. 4. Then five cannabis companies listed their shares for trading on major U.S. exchanges: two on the Nasdaq and three on the New York Stock Exchange. 5. And finally, adult-use cannabis sales exceeded medicinal sales for the first time. All this took one year… and most of it happened toward the end of the year. Now we are in 2019 and the cannabis market is ready to hit the gas pedal. But there are still plenty of reasons to be cautious before investing in any cannabis companies. Many have been overly promoted by unknown managements with questionable backgrounds. In Canada, many began as mining companies turned cannabis companies. So please, do your homework before buying in. My team and I have combed through all kinds of information. We’ve interviewed management teams and other entrepreneurs in this new industry. The market is huge, the companies are becoming “real,” and support for full legalization in the U.S. is gaining traction. As mentioned above, we believe the opportunity is potentially greater than the Prohibition analogy. Medical and adult-use cannabis in the U.S. alone will disrupt markets where current spending is more than $500 billion. In 2018, legal global cannabis sales were $12.2 billion. This is projected to more than double to $31 billion by 2022, a mere four years from now. Another independent source suggests the legal global market will reach $146 billion by 2025. That represents an average annual growth rate of 42%. And even if this estimate is overly optimistic and we only get halfway to the $146 billion, it is still a 30% annual growth rate. Few other markets grow this fast year after year. Take health care spending… Even though premiums go up every year, copays rise, and prescription drugs keep rocketing higher… total national health expenditures as tracked and reported by the Centers for Medicare and Medicaid Services (CMS) increased around 6.5% per year between 1990-2016. That’s twice the level of average inflation. And investing in the S&P 500 Health Care index would have provided a good annual return of about 10% in that period. Now compare this 6.5%-10% annual growth for health care spending to the 30%-40%-plus annual growth in the emerging cannabis market and the potential for returns. Cannabis projections makes the growth in U.S. health care spending look like a drop in the bucket. Big, reputable, trusted brand-name companies are starting to believe that cannabis is here to stay. 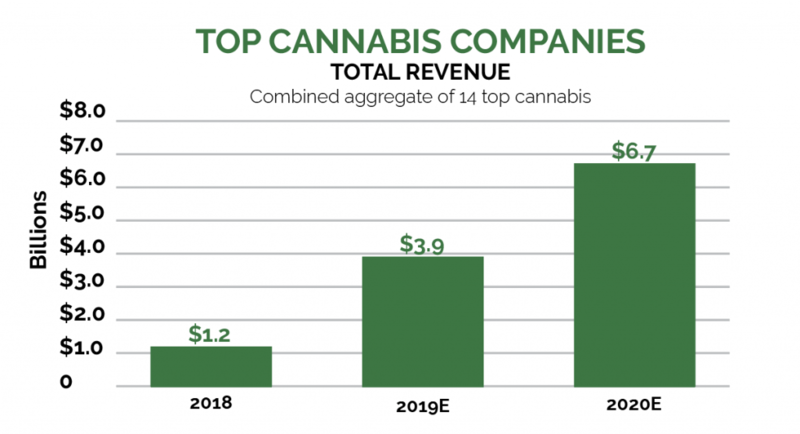 Several companies – Altria (MO), Anheuser-Busch InBev (BUD), Molson Coors Brewing (TAP), and Constellation Brands (STZ) – have made major financial investments in cannabis companies. As of February 2019, these companies had a combined market cap of nearly $300 billion. These successful, sophisticated organizations are expert allocators of capital. There are two reasons these deals were made. First, they see opportunity for investment gains. This means if we invest, we are investing alongside global partners. Or they are looking to protect their turf. They expect the cannabis companies to have sales that significantly eat into their current businesses. That, too, is good for us as investors. Both of these reasons suggest good things for cannabis companies. Strong sales mean there is opportunity to make money and see the value of shares rise. In our observations of the cannabis industry, we have found more than 60 companies that are publicly traded. Most are too risky and not worth looking at right now. Many have stock prices of less than $1 a share and market caps below $500 million. As we tiptoe into this new industry, we should do it with companies that pass a few tests… they need good management, access to capital, and strategies that make sense. Companies that can meet these three requirements will often find success – measured by sales, the most important financial measure a growing company has. For nearly all the companies on our list, sales are rapidly rising. Tens of millions in sales are quickly growing into hundreds of millions. Consider the preceding chart. It shows total revenue of our target list in 2018 and forecast for 2019 and 2020. As you can see in the chart, we are taking a much more analytical approach to the cannabis industry. There are many avenues for which cannabis will likely be used, processed, and distributed. At minimum, it’s likely that cannabis will be broadly available for adult use – just like alcohol and tobacco – in many parts of the U.S. and around the world. Valuation for cannabis stocks today is often irrational. Buying a portfolio of these stocks requires a belief that revenue growth will actually occur and that they will grow into their valuations. We are looking for companies that are “less expensive” than the broader group, but also have significant growth potential. You must be prepared for significant volatility. This volatility will occur both on the upside and the downside. Because of this, investors must keep an eye on their positions. As stocks rise within this emerging disruptive industry, it may make sense to take profits in some names. Conversely, as market fear pushes stocks lower, it will take guts to increase positions of the best companies. If you’re interested in learning more about this industry, I’m releasing many of my findings during an educational video presentation on Wednesday, March 27. You can RSVP for free by clicking here.